Taste test: These are excellent tortilla chips. They're thick, strong, crunchy, large chips. 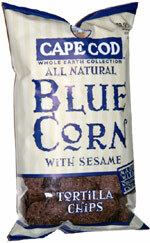 Best of all, they're made with sesame seeds, which is a first for a tortilla chip, as far as I'm aware. You can actually see the sesame seeds inside the chips. The taste is great. The corn is tasty, and the sesame taste adds a nice twist to it. Smell test: A bit different than regular tortilla chips. You can smell the sesame.